In this section of our tutorial we will cover the main features that the administration area of Drupal 8 offers. The dashboard allows you to perform various actions but it might be a bit confusing on the first sight. However we will explain each section’s purpose, so you can get used to the interface easier and focus on developing your new website. As the image depicts we have divided the administration board by 8 sections with different purpose and we will now cover them one by one. Here you can add and manage the content on your website, such as articles, pages, forum topics, polls and any custom ones you have created. You can also find and edit the existing content. Additionally from this section you can manage and approve comments and administrate the files added. Block layout – the blocks are actually container objects that include content of your website. They can be displayed in different regions of the pages and you can organize what and where to be displayed in them. 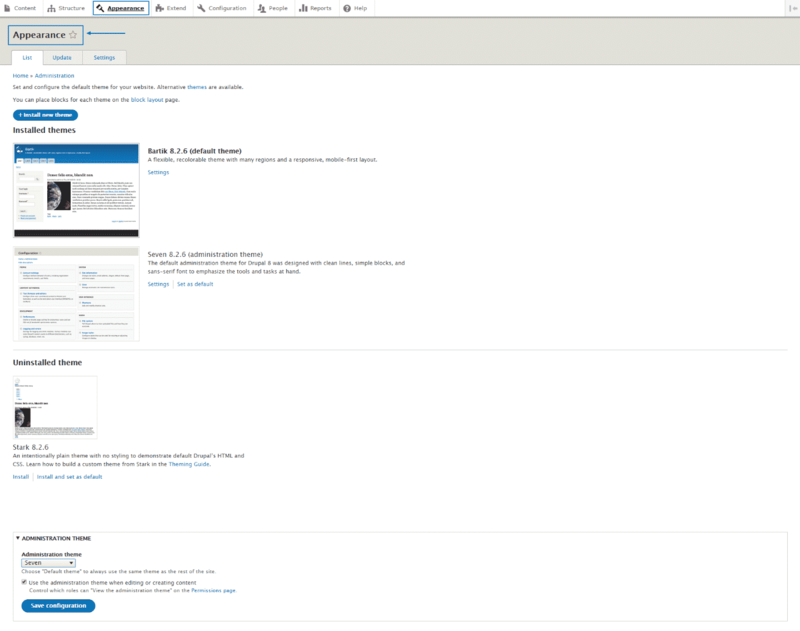 Comment types – in Drupal you can add more than one comment type. Actually you can use the default one or add such for block, contact, users or taxonomies comments. You can also add comments to comments. Contact forms – here you can create or edit contact forms that you want to use on your website. For example you might want to create different ones for reporting bugs and administrative questions. Content types – here you can check the predefined content types and add new custom ones. The content types in Drupal represent the format of the data you want to add to the website. You can choose from Articles, Basic pages, Book pages, Forum topics, Polls and custom data formats that meet your needs. Display modes – this is the place from where you can edit the viewing and editing form of the different content on your platform. Menus – this subsection is responsible for the menus available on the website. Here you can control the administrative menu, the footer, main navigation, tools and user account menus. It also gives you the opportunity to add new menus and enter different links in them. Taxonomy – this feature can be considered as a method for classifying the content on your website based on the taxonomy terms such as tags. The Appearance section is associated with the look of your website. You can review, manage and update the existing themes, add new one and make modifications to the logo and favicon. 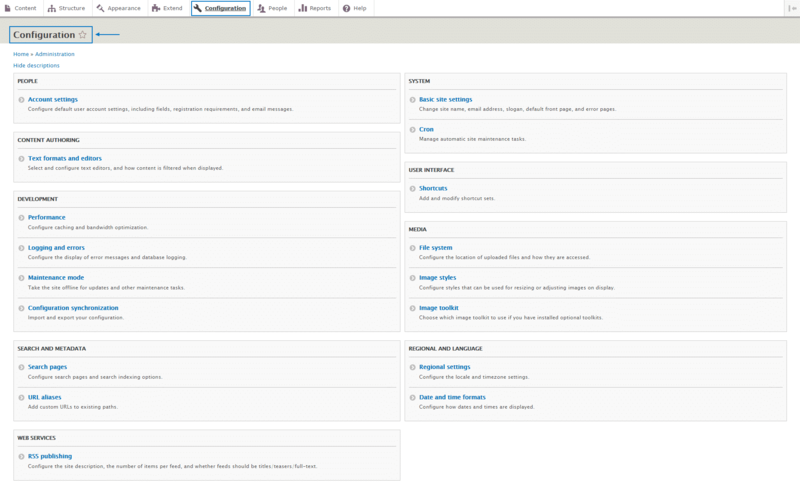 This section of the main dashboard menu allows you to add, manage, update and uninstall modules to your Drupal application. You can also review all the installed ones and enable/disable the ones in need. System – manage the basic site details such as site name, slogan and contact information and also the cron job settings. Content Authoring – you can assign different rights for posting various types of content to the user roles you have added. 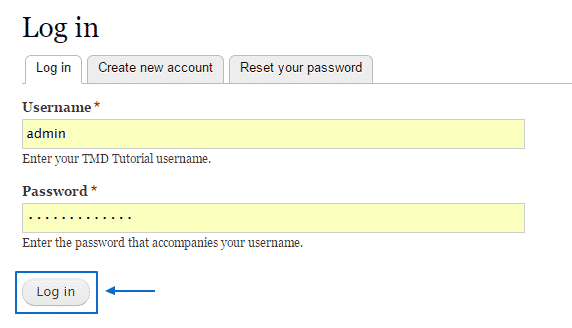 User Interface – it controls the shortcuts available in the admin account page. Development – here you can configure the caching optimization of the platform, check the error logs, turn maintenance on and off and synchronize the configuration. Media – manages the location and access permissions of the files uploaded, the image styles, sizes and toolkits in use. Search and Metadata – this section is associated with the SEO of your website. You can set URL aliases to specific pages and manage the search indexing options. Regional and Language – configures the regional, timezone and time format settings. Web Services – here you can control the RSS feed of your platform. This section gives you the ability to add and manage the users of your website and assign different roles and permissions to them. The Reports section allows you to review information concerning the available updates for the modules and themes installed, the recent log messages, the top error pages reached and the most searched phrases on your website. Here you can obtain more information about the core functionalities and instructions for various actions you might need to perform.